Austin, TX – November 29, 2018 – (GuitarPR) – Journey Instruments, makers of high-end wood and carbon fiber guitars designed for travelers by travelers, is introducing its new First Class Overhead line of guitars through a unique Kickstarter campaign. Early supporters of the campaign will benefit from substantial savings on the first full-size, collapsible guitars with their own carry-on roller bag. 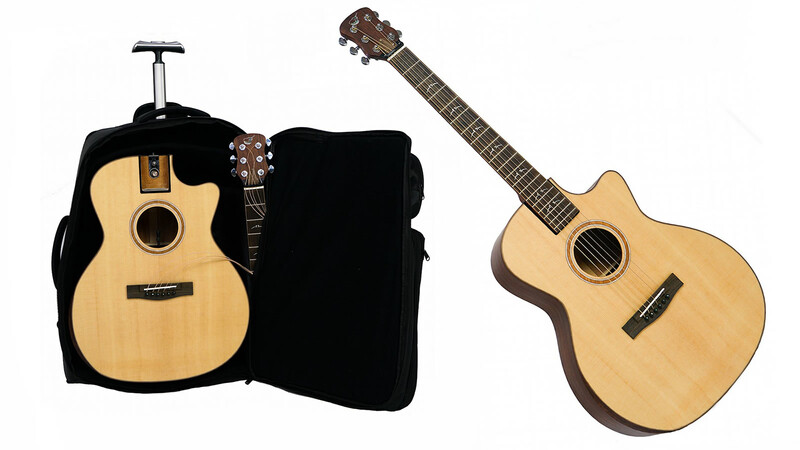 According to Rob Bailey, founder of Journey Instruments, “Our new First Class line allows you to carry-on a great sounding, full-sized guitar in a roll-on bag designed to fit in the overhead compartment.” A patented stainless steel neck connection system assembles in less than 10 seconds with no tools and has been road-tested for 6 years in the market. On top of all that, it is guaranteed for life. James Brawner, partner at Journey Instruments, who has a background in Aerospace Engineering explains, “We reverse-engineered the problem by starting with the airline’s carry-on dimensions and worked backwards to create the best sounding, best feeling guitar that is guaranteed to fit.” In addition to being carry-on sized, the roll-on bag includes a TSA-approved 15” laptop compartment, telescoping handle and wheels, zippered compartments for books, headphones, guitar accessories and even a change of clothes.